Kouther ... optimistic about the future. Confident that Saudi Arabia’s ambitious vision of economic development will bring about a surge in demand for concrete, Saudi Building Materials Company (SBM) intends to return to Saudi Build this year optimistic of clinching new deals and partnerships. 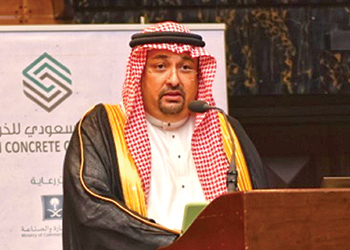 “The National Transformation Programme (NTP), a key part of a blueprint to prepare Saudi Arabia for the post-oil era, and Saudi Vision 2030 will provide great stimulus to the commercial, industrial and construction sectors of the kingdom,” says Ahmed Kouther, CEO and managing director of SBM. He says the ambitious vision aims for a comprehensive development of society and cities while maintaining a healthy environment, supporting the economy, industry and investors, and providing housing for citizens. “This, in turn, will boost the demand for concrete, which is expected to keep rising, thanks to the increasing urbanisation and the growth of the hospitality sector to accommodate the surging numbers of pilgrims,” he adds. He also points out there has been a clear change in the nature and quality of mega projects being developed in the kingdom in recent decades. Saudi Arabia is the largest readymix concrete market within the region, given it accounts for more than half of the GCC’s construction projects, valued at more than $1 trillion by 2019. The concrete market in the kingdom is worth SR20 billion ($5.33 billion) a year, and there are more than 400 companies with an investment of more than SR100 billion ($2.67 billion) that employ more than 35,000 people in the sector. “Therefore, it is essential that the concrete industry keeps abreast of the latest advancements since it is the backbone of construction,” says Kouther. Hence, since its inception SBM has played a pioneering role in the readymix concrete sector in the kingdom’s Western Province. SBM has also led the market in quality certifications, Kouther claims, having been the first readymix company to achieve ISO 9002 in April 1994, ISO 9001 certification in 1999 and ISO 9001:2000 for production, delivery and testing of aggregates in Jeddah and Yanbu areas in 2003 – which has been updated to ISO 9001:2008. “We are also in the processing of setting up an HSE (health, safety and environment) system in compliance with OHSAS 18001:2007 (Occupational Health and Safety Assessment System) and intend establishing an environmental control system in compliance with ISO 14001:2004,” he adds. SBM started out with one factory in Jeddah and then added one more there before moving to Yanbu and then to Riyadh. Today, it has nine concrete factories in the kingdom and is still is expanding. “Today our factories are located in three cities in Saudi Arabia. This was achieved following the entry of new partners – Fisal Al Kaaki, Akmal Madani, Zaki Farsi and Rafiq Kredeh,” he states. Its operation has grown from six mixers and two pumps to more than 45 truck mixers and 15 concrete pumps. Annual production has gone up from 36,000 cu m to over 350,000 cu m with much more equipment supporting the production. SBM produces all types of concrete that have been used on highways, streets and bridges, parking lots and garages, high-rise buildings, dams, driveways, and numerous other applications. Its product portfolio includes high-strength concrete; piling concrete; key wall concrete; early-strength concrete; concrete masonry; readymix concrete; roller-compacted concrete; shotcrete; architectural and decorative concrete; stamp concrete; prestressed concrete; and concrete pavements. SBM started using precast concrete technology for huge spans such as bridges and tunnels and set up a precast concrete factory located between Jeddah and Makkah five years ago. “This technology has proved to be highly beneficial in fast-track work such as the installation of a boundary fence between Saudi Arabia and Yemen,” says Kouther. The company has also developed other high-tech products for crushing and added modern concrete products. He points out that the company can maintain schedules even for the most challenging big pours with its fleet of over 160 mixer trucks and pumps and decades of experience – and can do it for heights of up to 43 m.
“We have the best raw materials including blasted and Barmac-cubisized aggregates from our own quarry. Our screened sand gives consistent quality, good workability and strengths up to K80. And our laboratories give full reports of every aspect of our concrete,” adds Kouther. Furthermore, concrete can be optimised with customised mix designs including the use of advanced admixtures. “And when required, professional assistance is also available on-site, for example, hot weather concreting using SBM’s chilled concrete,” he says. Driving its success in the market is its team of technical and management staff, who have over 50 years of experience producing concrete to meet any specification. “Besides, our laboratory offers a full concrete and aggregate support service supported by an American Concrete Institute (ACI)-certified technician and we provide free technical support service to solve our clients’ concrete problems,” says Kouther. SBM is also very active in the community and has played a role in raising the bar in the concrete industry. It has contributed to the founding of the National Committee of Ready-mix Concrete under the umbrella of the Chambers of Commerce in Riyadh. “We support the awareness campaign in Jeddah and have embarked on a programme with the ACI which has involved bringing in specialised concrete consultants, and hold training courses and workshops to educate clients, contractors, engineers and developers,” says Kouther. He points out that concrete, the most used building material in the construction sector, consumes nearly 40 per cent of the world’s total energy. Hence, the production process and applications have significant impacts on the environment and natural resources. “To mitigate these effects, it is necessary to commit ourselves to the establishment of a sophisticated industry that is sustainable, focused on ensuring low energy requirements, and uses renewable resources to minimise waste and ensure long-term durability and low cost,” says Kouther. About its participation at this year’s Saudi Build, he says SBM has been part of the exhibition in recent years when it opened a new branch in Riyadh and wanted to promote it. Kouther says last year’s event provided the company with opportunities to meet senior decision makers from the public and private sectors and discuss our products and services with them. In terms of business, he says SBM has maintained the same turnover as last year. The bearish market trend has had a little impact on the company, he adds. Amongst the important projects SBM has completed are Yanbu Industrial Port, Jeddah Islamic Port and many towers and landmarks of Jeddah, in addition to successfully pouring the runway at King Abdulaziz International Airport in Jeddah. SBM is currently supplying readymix to mega projects in Saudi Arabia being carried out by well-known contractors. These include the Lamar Towers (Drake and Scull International), expected to be complete in 2018 under a SR1.5 billion ($400 million) deal, the Al Sairafi Mall (Quthmi Contracting) and Jeddah North Beach Development (PC Marine), both of which are due for completion next year, and the Red Sea Mall (Ashi and Bushnaq Contracting), which is scheduled for completion by the year-end.